• Set up a nice working area you can use, such as a small desk in the middle of your room or something similar you can work with. You will need that space further down the line. • Find stronger, smaller boxes that are no bigger than the size of a microwave oven. This should give you enough space to work with, at the same time making it more manageable and easier to deal with than using smaller boxes or larger ones that may fall apart because of the added weight. Ensure you have thick cardboard boxes to work with and you will have an easier time managing them throughout the storage ahead. You can find good quality boxes at self storage facilities and can ‘kill two birds with one stone’ by picking some up when you arrange storage. • You would do well to lay all your books near your work area before you start packing them and preparing the possible storage options. • Something else worth remembering is that hard covers and soft cover books will need to be separated if you want to keep them safely stored. Hard cover books will be heavier, so you will need to place them in more manageable boxes, as they may become far too heavy to move safely in larger boxes. • Place any books you have upright, as this will allow you to fit more of them with ease without endangering the spines. Any gaps you have remaining can be filled with packing paper or bubble wrap to keep them from moving around during the move or while in storage. 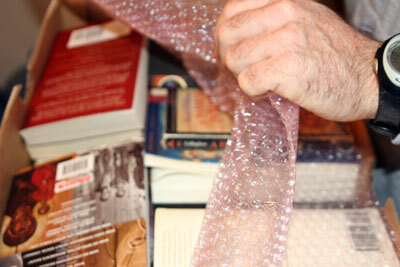 • Silica gel packages will work well when you need to keep the books safe and dry for extended periods of time. You can find some in most home improvement stores if you do a little bit of searching. • Labelling all boxes and their contents is necessary if you want to know what goes where. Depending on the size of your private library a good inventory list will allow you to keep track of all your books without losing anything. Ella Andrews is passionate blogger and professional writer with great flair for home maintenance and self storage projects. She’s been writing about similar topics for a long time, but is also constantly searching for new sources of inspiration. Posted in Self Storage, Selling a house, Storage Tips, Uncategorized.